reaching Platinum status in April 2008. 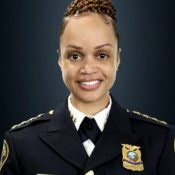 Last week, Portland Mayor Sam Adams made a surprising move by firing Police Chief Rosie Sizer and moving control of the bureau back into his office (and away from Commissioner Dan Saltzman). There might be more to report on this in the weeks to come (will Adams relinquish the transportation bureau to make room for police? 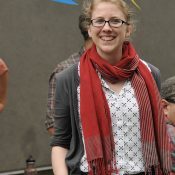 ), but for now, with Sizer suddenly out of the picture, I thought I’d look back in the BikePortland archives to recall when and how she engaged with bike issues during her four-year tenure. 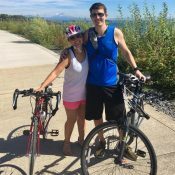 The first time Sizer made bike news headlines was when she came to the table following two fatal bike crashes in October of 2007. Those tragedies — and the controversial and inflammatory way some officers reacted to them — put the police bureau’s role in bike issues squarely on Sizer’s radar. 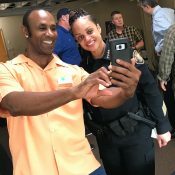 It was at that meeting where Sizer likely hatched the idea to name Officer Robert Pickett as an official liaison to the community on bike issues. Pickett has excelled at this role and even garnered an Alice Award from the BTA in 2009. Less than a week after the aforementioned meeting, Sizer made a surprise, off-duty appearance at a rally for bike safety where many people held up signs critical of the police bureau. 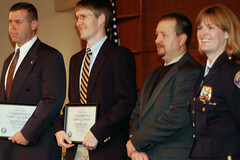 policing award in December 2007. 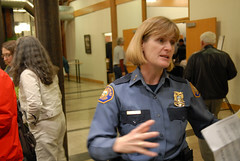 Taking a respite from controversy, Sizer was on hand in December 2007 to bestow an award in recognition of bike patrol officers for their “immeasurable impact” on the community. Just two months after the rally mentioned above, Sizer re-assigned the top two officers at the Traffic Division that were the source of much of the community’s anger. Following that tumultuous period in police relations, a new era began to take shape. 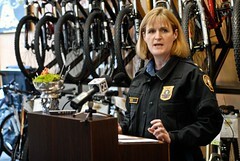 In February of 2008, Sizer issued an executive order that altered the police code and lowered the severity threshold of bike-involved collisions that would trigger an investigation. 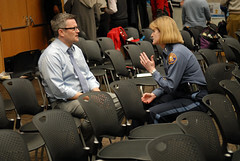 A few months later, with new leadership at Traffic Division sincerely engaged in bike issues, a Community Policing Agreement began to take shape. The agreement laid out the state of the relationship and expectations between the community and the police bureau. It was passed by City Council 16 months later and will be reviewed and revised if necessary on an annual basis. Most recently, Sizer attended the Transportation Safety Summit where she was one of the featured speakers. Under Sizer’s watch, I have seen Traffic Division officers become more engaged and sincere about being productive community partners than ever before. I believe that rank-and-file attitudes reflect the tone set by leadership and therefore I feel credit is due to Sizer. Luckily, I have heard very positive things about new Police Chief Mike Reese and look forward to continuing to maintain and build on this strong relationship. I’m hoping that Nick Fish runs for mayor in 2012. The longer Sam Adams is in office, the less character and dignity he shows. Rosie Sizer has been a thorn in the side of Portland for far too long. This is actually one of the first things I really side with Mayor Adams on since he took office. (A position I believe he should not hold). Now if only he would fire Kroger……. For that I would throw a big party…. I’m pretty certain that everyone in town who deals in local politics knows for sure now that Adams is certifiably crazy and trending crazier, that he really blew this one, and that he stands absolutely no chance of being reelected in ’12. Sizer might have been an OK advocate for the cycling scene but she sure as hell was a terrible Police Chief when it came to everything else. The decision Mayor Adams made last week gave him major points in my book, no matter how long overdue the decision was. The fact that Adams was just as appalled at Rosie’s unapologetic statement on the Chasse settlement earned him kudos from me. A few more examples of similar leadership and I might reconsider my lack of support. Really nice article Mr. Maus. Thanks for the footwork on summarizing Sizer’s time in hot seat. Rosie was and is a false advocate for the bicycling scene. Over the years she has caused problems for cyclists, not to mention the disruptions caused by those under her direct control, even before she was the chief…. This goes back many, many years. It is only in recent years that she has given the appearance of supporting the cycling scene. I think you could have categorized it as overdue but can anyone be surprised that with how completely she lost control of the officers that she was fired? I wrote an earlier comment, which has got caught up in the ‘works’ for some reason. Sizer wasn’t perfect, but everything in perspective, she did a fair job. Considering whether Sizer ‘lost control’, of the officers as commenter ‘surprising’, puts it, brings to my mind the challenge the police chief is confronted with, of having to deal with the long standing tradition of rank and file officers in which they back up nearly every action of their fellow officers regardless despite how questionable and possibly wrong that action may be. That kind of indiscriminate solidarity can do plenty of damage to the ethics that support the police force and to the relationship between the force and the public that must be constantly tended to in order that it be a positive one. Plenty of rationalizing that the rules and procedures were followed…goes on, with slow progress towards changes in rules and progress that would be more consistent with the needs of a changing public. The loss of control by the chief of Portland Police officers existed long before Sizer got the job. The new guy…Reece…is going to have his hands full. I’d imagine he’ll be drawing heavily on all that counseling experience he acquired earlier in his career. Thanks, Rosie, for all you did for us. 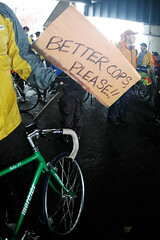 Thanks, Rosie, for coming to the memorial event event under the Hawthorne Bridge during a torrential rainstorm. I saw you there. You weren’t in uniform, you weren’t glad-handing, you weren’t looking for publicity, you were there to hear what concerns us. You listened and you took action. Thanks, Rosie, for changing the Bureau’s policy for investigating traffic accidents that injure cyclists and other vulnerable traffic victims (Dir 640.50). Thanks, Rosie, for encouraging officers to exercise discretion before citing cyclists for non-dangerous traffic offenses. You had the toughest job in local government and you made a difference. This action just goes to show how petty Adams is. I wish someone would fire him. Adams fired Sizer because of a budget disagreement. He wanted to cut the police budget and Sizer objected to it, so he fired her. The Chasse Case was a transparent cover up. Read the news (Willamette, Oregonian). I was glad to see her go for the fact that she so dissed Jessie Jackson by saying that he “Was not an authority on use of force, but it was nice to have him here to help the community heal”. Condescending much !!! As for Adams, I am proud to have an openly gay person gain office, but the fact he lied about his “romancing” a 17 year old, who worked for him, and then calling his opponent a lair. The later part of that is messing with elections, big no no. If any teacher had been romancing a student with plans to meet them at age 18, they would be OUT !! There was no “healing” from Jessie Jacksons visit to Portland. Quite the opposite.